Why should you use this calculator? Use this calculator to quickly calculate the actual flow rate through the Venturi tube flow meter with only a few inputs. This calculator performs the flow rate calculation from the measured pressure difference caused by the flow contraction in the throat of the Venturi tube. Due to the contraction in the diameter from the inlet to the throat of the Venturi tube, the flow velocity is changing while flow rate remains constant. That change in flow velocity is creating the increase of the dynamic pressure and drop of the static pressure, as total pressure remains uniform, according to the conservation law. The change of the static pressure can be easily measured. That measured value is the input value for the calculation of the flow rate in the Venturi tube. You should measure pressure in front of the Venturi and the Venturi's throat and use that value in the calculator. This calculator also calculates total pressure drop created by the Venturi tube, although it is much lower than in other pressure differential metering devices like an orifice. You can use the calculator for the Venturi effect (change of the static pressure due to the flow stream contraction) analysis, also. Many devices like Venturi vacuum pump, gas burners, wine aerator, aspirators, grills, and others use Venturi effect for their operation. These devices are creating the drop in static pressure, and that pressure change is inducing the flow of the other fluid. 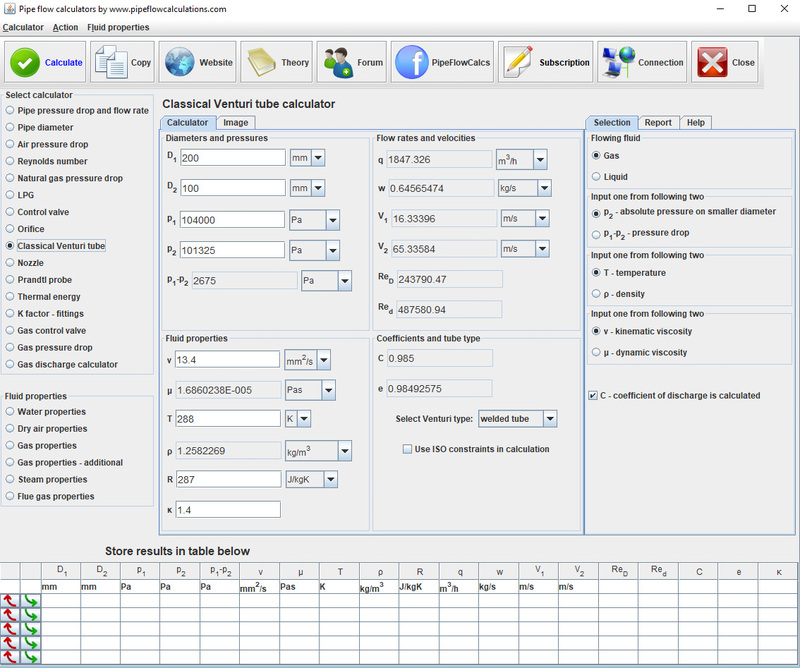 The calculator is relevant for a subsonic flow single-phase liquid or ideal gases. It is not applicable for pulsating flow, or non-steady flow when the flow rate is changing in time. This calculator is not suitable for flow of multiphase fluids, like a stream of liquids that contain solid particles or stream of liquids that contain undissolved gases. Also, it is not suitable for gases that are not ideal, i.e., gases that don't relate to the ideal gas law. Limiting factor for Venturi effect is when the flow reaches chocked flow and mean velocity is close to the local speed of sound. What has to be understood to perform the calculation? To calculate flow rate, you have to enter the Venturi tube inlet and throat diameter, together with fluid properties - density and viscosity. For a gas as flowing fluid, instead of the density, you can enter gas constant, pressure and temperature at actual conditions. Density is then calculated using a perfect gas state equation. You should enter density on real flow conditions - real pressure and real temperature. The calculator is doing calculation according to ISO 5167-4. You can expect to have accurate and reliable results solely if the Venturi tube satisfies the requirements from the standard. What are the standard ISO 5137-4 conditions? For the flow of a perfect gas, the pressure reduction produced by the Venturi tube (p2/p1) must be higher than 0.75. What happens if a calculation is not within these limits? If the Venturi tube characteristics or flow conditions are not according to the ISO 5167-4 calculator presents the message. If you still want to perform calculation regardless of the conditions in the standard, you can choose not to use ISO constraints in the calculation.